You all know that my son is a giant beggar. He wants a "bite" of whatever we're eating. 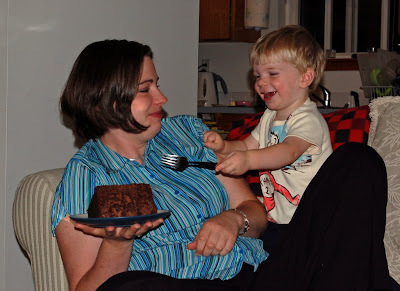 But when it comes to "cake", and chocolate cake at that... there are no lengths to which he will not go to get a "bite"... or more than one! This is the chocolate cake that my parents brought back after we went to Ze Ballet last month. It was heavenly. Cory agreed! This picture is entered in the Fun with Food photo contest over at 5 Minutes for Mom! The reaching with the fork is just too cute. :) I would end up giving him all the cake he wants! how bout sometime next week, thursday or somthing? He's REALLY into it! My daughter on the other hand, doesn't eat cake or cookies. Strange kid I have. Great shot - Thanks for your entry!